# Preheat oven to 180C. Grease a large slice tray. # Mix all dry ingredients. Add melted butter and mix well. Add vanilla and mix in. # Press mixture onto tray, smoothing out with the back of a spoon. # Bake for 20 minutes. Let slice cool (can be cooled in the fridge). 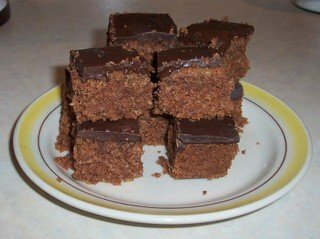 # To Make the Icing: Melt cooking chocolate and pour over slice.